This recipe is delicious and is really suitable for family and friends alike. I like to just leave all the components of the meal in the middle of the table and allow all of the guests to help themselves and build their own fajita. The stir fry part of this recipe is also suitable for pork, duck or chicken. Heat a large saucepan or wok. Have all of the ingredients prepared in advance because you do need to stand over this dish. Add a little oil to the wok together with the chilli, garlic and sliced chicken. Next add in all of the sliced vegetables into the wok and allow these to cook quickly. 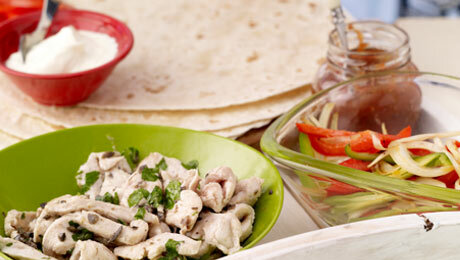 Spread a little olive tapenade over the tortilla wrap. Layer the chicken, vegetables and crème fraiche on top, serve immediately.